Most of us will have experienced the luxurious soothing bubbles of a hot tub, whether it’s in a local health club or as part of a hotel stay. In times gone by, having your own hot tub was a privilege only afforded to those with a good deal of disposable cash. But times have changed and there is a wealth of inflatable hot tub options available on the market. Coming home from a hard day, you usually soothe your tired muscles by having a hot relaxing shower. 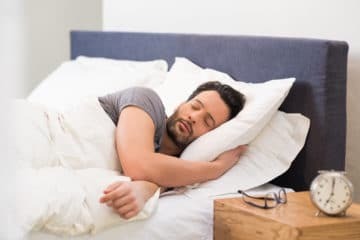 But, if you dream of sinking into hot bubbly water and relaxing in the peace of your own home, you are not alone. More and more people are choosing inflatable hot tubs, so they can enjoy the therapeutic benefits without having to leave their house. However, deciding upon the best inflatable hot tub for your needs can feel a little overwhelming. With so many settings and features to consider, it can be rather daunting to an inexperienced buyer. In this review, we take an in-depth look at some of the best choices in the UK; giving you our honest opinion so you can decide upon the perfect hot tub for you. If you have never purchased an inflatable hot tub before, the volume of choices can make settling on a particular one difficult. In order to make the correct choice for you and your home, there are a number of considerations to take into account before buying. First of all, the most important factor to think about is how many people are going to use it. If it is just you and a partner, smaller two-seater hot tubs will be sufficient. However, if you have a family of four or more, or wish to have big gatherings, then a larger spa will be required. Most inflatable hot tubs have a maximum capacity of 6 adults but check the reviews beforehand. While some of these models claim to accommodate 6 people, it can mean getting rather close and personal to those you are sharing with. Depending on your preferences, an inflatable hot tub with seats might be best for you. Alternatively, a cheaper one can offer an inflatable base for comfort instead of seating. The shape of your inflatable hot tub is also important. Certainly, the majority of inflatable jacuzzis are round in shape, but there are some options which are square, or even oblong. Square inflatable spas offer a cosy corner to lounge in, while oblong versions are usually intimately designed so couples can face each other. Another consideration to note is the amount of air jets provided. Of course, the power and number of these jets dictate how effective the massage system will be. In general, an average of 80-100 air jets will offer a realistic spa-like experience to rival the real thing. Moreover, you mustn’t overlook the quality of the hot tub filtration system when browsing inflatable hot tubs for sale. 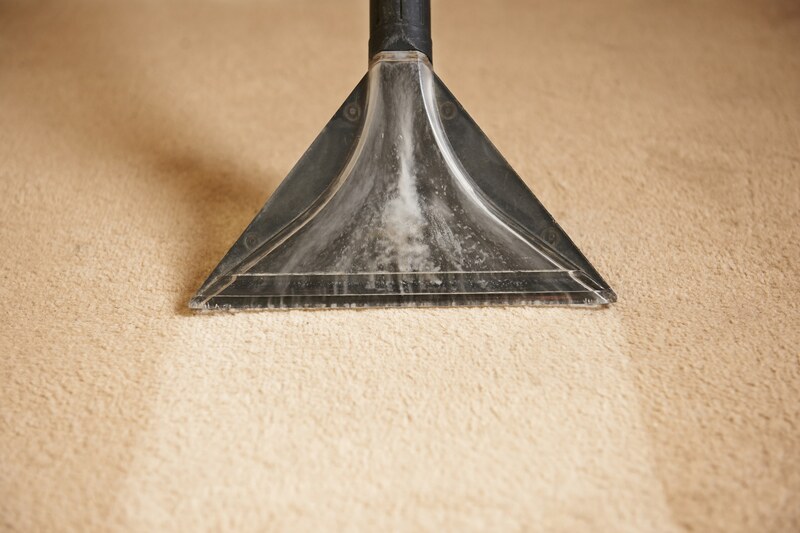 This system is responsible for maintaining the cleanliness and clarity of the water you will be soaking in. The last thing you want is to invite your friends to enjoy your new hot tub, only for them to be put-off by murky water. 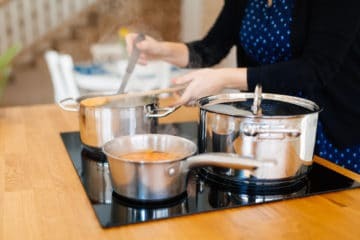 Lastly, you should think about when and where you are going to use it, and therefore, what temperature the water should be for optimal enjoyment. Most inflatable hot tubs will have a maximum water temperature of 40 degrees, which should be enough for most individuals. Obviously, this also raises the question of energy and running costs. If you choose a large inflatable hot tub, your energy bills will be higher. Luckily, many inflatable jacuzzis offer a heater timer option, so you can set the heater to be on at a specific period of time. Unsurprisingly, there are many benefits to having your own inflatable hot tub. One of the most obvious is the positive effects hot tubs have on our health and wellbeing. The combination of massaging bubble jets and hot spa water is wonderfully soothing for both tired muscles and stressed minds. Stress can be very detrimental to our health and is a growing issue in today’s fast-paced world. Being able to come home from a tough day and sink into your own inflatable spa is sure to enhance your life immeasurably. 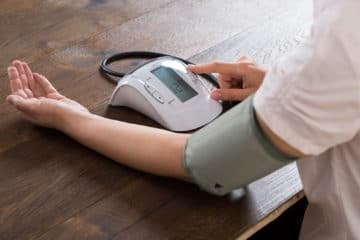 In fact, hydrotherapy or immersion in heated water has been proven to reduce blood pressure, lower heart rate, improve arthritic pain and even ease pain from fibromyalgia. Furthermore, inflatable hot tubs are much more affordable than standard, permanent hot tubs. This means that everyone has the chance to enjoy the spa experience in the comfort of their own home, not just those with a higher income. An inflatable hot tub may not last as long as a fixed hot tub, but the amount of money you save will easily balance this. In addition, inflatable hot tubs are easily transportable, which means you can enjoy them outside, in the garage, on your decking, or even inside your home. They can also be taken on a camping trip, which cannot be said for fixed hot tubs. Also, this makes them easy to collapse and store away when not in use. Lastly, inflatable spas are much easier to set up and install than permanent hot tubs. No construction work or additional electric tools like cordless drills are required. And, they can be ready to fill within minutes of opening the box. 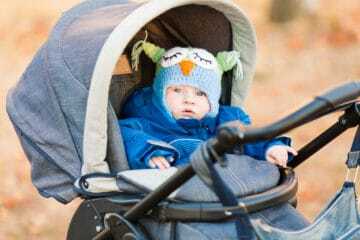 Now we have examined the benefits and what to look, it’s time to decide. Let’s take a look at our top 10 inflatable hot tub reviews from three of the most popular brands – Lay-Z-Spa, Intex, and MSpa. The Lay-Z-Spa Paris with LED lights is incredibly popular. One of the first models released by this top hot tub company, this hot tub has a cool multi-coloured lighting system which can be easily controlled using the wireless remote provided. The lights can change to 7 different colours, enabling you to set the right mood whatever you are up to. Replacing these lights requires the hot tub to be emptied, so it’s best to check them first before filling. Having a durable I-Beam construction, the design of the Lay-Z-Spa Paris is built to last. 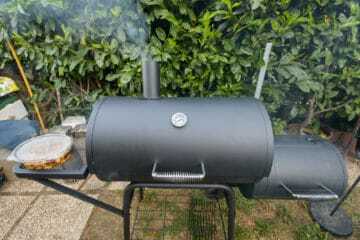 Its internal heating system is controlled by a timer, so you can set the tub to be ready whenever you are. With a maximum temperature of 40 degrees, you and your loved ones can enjoy relaxing in this hot tub at any time of year. The Lay-Z-Spa Paris Hot Tub can comfortably seat 4 – 6 adults. 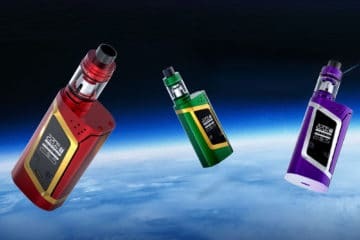 Its revitalizing air jet system uses an impressive 87 air jets to provide 360 degrees of indulgence. Water is kept clean and clear by a high-quality water filtration system, so you won’t need to worry about murky water when entertaining friends. You must remember to buy chlorine tablets for use with this system though, as they are not included with the hot tub. Operating this tub is a breeze due to the digital control panel. Positioned in a convenient location, you can quickly adjust the settings according to your desire without having to move from your seat. Setting up the Lay-Z-Spa Paris is also simple and relatively speedy. 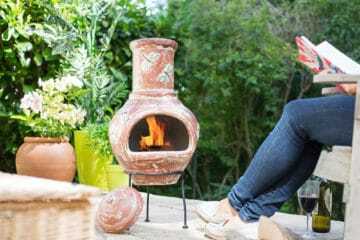 You can be ready to use it in as little as 10 minutes so those impromptu hot tub parties can get started immediately. Although, the 10-minute set up means you’ve had a lot of practice. It may take longer if you are not used to setting up a portable hot tub. 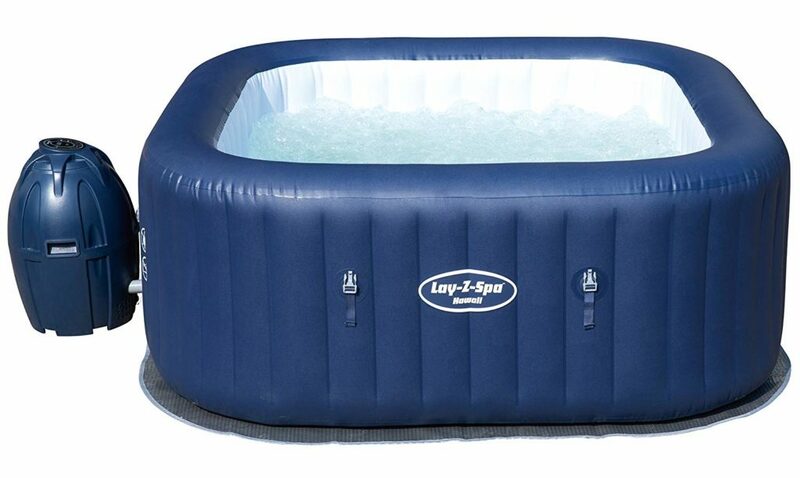 The Lay-Z-Spa Paris comes with an easy lockable inflatable top lid and a leatheroid cover to keep your hot tub clean and protected from the elements. 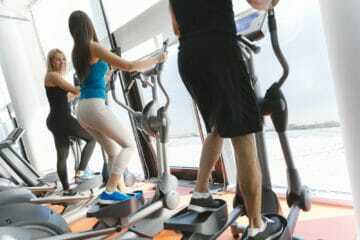 You also receive a cushioning pad floor mat to maximise insulation during use. The Intex Octagonal PureSpa is a portable and high-quality hot tub which enables you to soothe away a long day in the convenience of your own home. 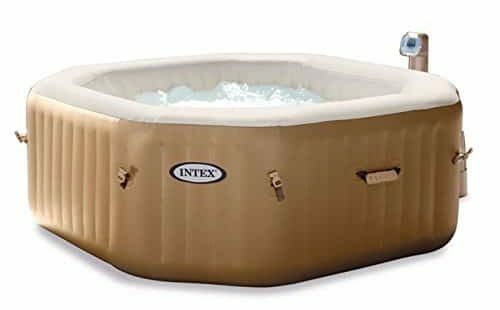 Large enough to fit 4 adults comfortably, this Intex hot tub boasts of the super-durable “Fiber-Tech” construction for added stability and comfort. Featuring an amazing 120 high powered massaging air jets, this hot tub is a great way to relax with friends. The Intex Octagonal PureSpa has an easy-to-reach control panel which allows users to change the air jet settings with the press of a button. Compared to other reviews, this has an intelligent temperature control and remembers your personal preferences. You do not have to constantly adjust and check it to suit your needs. The available temperature range with this Intex hot tub is between 20 – 40 degrees, although there have been some complaints regarding faulty heating systems with this one. If you live in an area which has hard water, don’t worry. The integrated Intex Hard Water Treatment System creates an electromagnetic field which softens the water, leaving it much gentler on both your skin and the spa itself. You can find out more about the effects of hard water in our article on how water softeners work. However, some customers have mentioned that you need to check the filters very frequently if it needs replacing, even with little use. It should also be noted that chlorine tablets are not included. If you are looking for a hot tub you can take away with you, look no further. The Intex PureSpa is incredibly portable, featuring built-in handles and a carry bag for effortless transportation. Keeping this hot tub clean and protected when not in use is easy too, thanks to the cover provided. 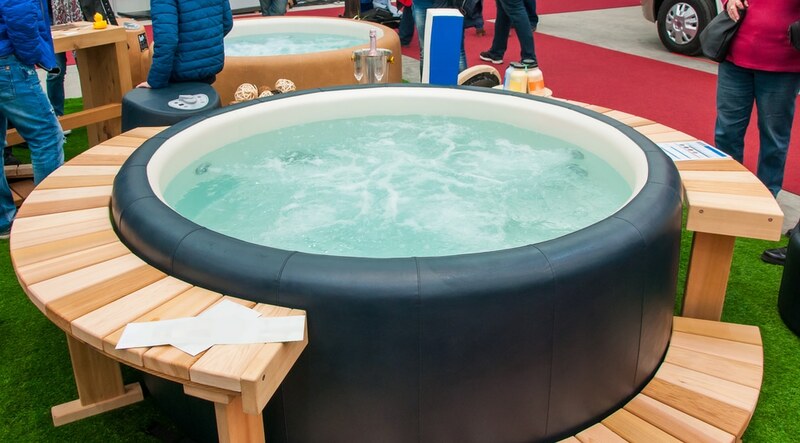 The Lay-Z-Spa Monaco Hot Tub doesn’t appear to be an inflatable hot tub at first glance. 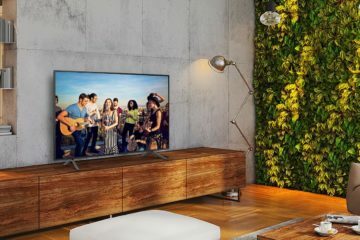 Different from other reviews, the walls look very slim and rigid, as if constructed from hard plastic, but instead this is simply the result of a very clever design. The walls are reinforced with sturdy drop stitch materials, which offer extreme strength and durability to rival a fixed hot tub. Such thin, yet resilient walls mean you have more space to enjoy. 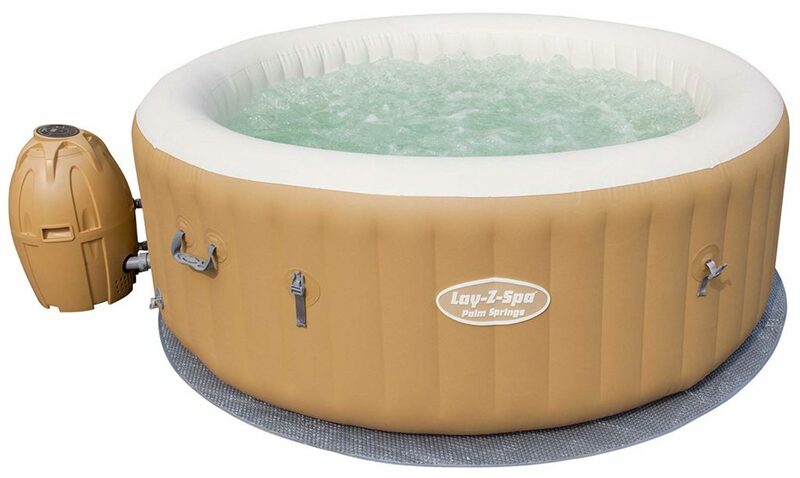 The Lay-Z-Spa Monaco is one of the more expensive tubs we reviewed, but it can fit between 6 and 8 people, two more than most inflatable hot tubs can manage. However, on the downside, extra space also means extra water capacity; so this hot tub can take up to 24 hours to become fully heated. The Lay-Z-Spa Monaco boasts a mounted control panel above the spa pump, which makes adjusting the settings a piece of cake. There’s no fiddling required either, most of the available settings can be switched on with one push. If you need to soak away a long day – relaxing in a stream of bubbles from the 86 air jets is sure to do it. Bubbles are directed from the base of the hot tub for a wonderfully soothing experience. 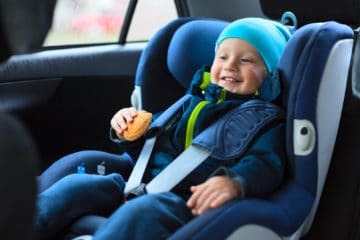 Water temperature can be heated to a toasty 40 degrees, but there are reports that the heater pumps do not last very long. The built-in water filtration system keeps the water clear and enticing. Two additional filter cartridges and a water filter housing unit are provided. An inflatable lid is included, which clips securely to the sides of the tub, keeping it safe from leaves and other debris when not in use. The Lay-Z-Spa Monaco is also very compact and easy to transport. 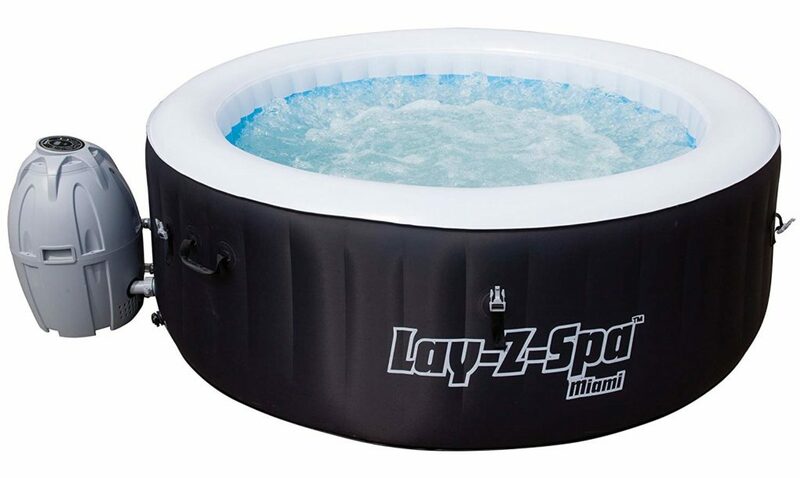 The Lay-Z-Spa Miami Hot Tub is one of the smaller inflatable hot tubs in our review, but it is still extremely popular. Lay-Z-Spa says the Miami is suitable for two to four people, but we think four people would be a little cramped. This inflatable hot tub would be a great choice for couples who are looking to get cosy yet still have some room to move around. This inflatable hot tub has hardy, puncture-resistant walls coated with rayon for ultimate damage protection. Inside, highly durable I-Beams provide a secure structure that ensures the Lay-Z-Spa Miami keeps its shape during use. This inflatable spa showcases a beautifully designed digital control panel which allows the users to accurately and quickly control the temperature, or initiate the 81 massage jets. Although, it should be noted that some customers said the pump can be quite noisy. Like most inflatable spas, the Miami is capable of reaching a balmy 40 degrees. The control panel also offers a convenient timer function, so you can make sure the hot tub is heated and ready when you get home. However, if you are planning on using this hot tub in the winter, it is worth noting that many customers have experienced mechanical issues when attempting to use the Miami in very low temperatures. 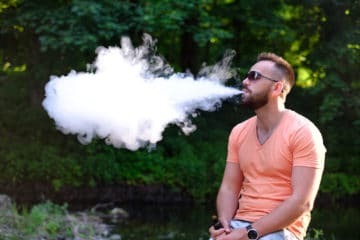 The Miami is very portable and comes with an inflatable top cover, locking clips, two additional water filter cartridges, and a filter housing unit. 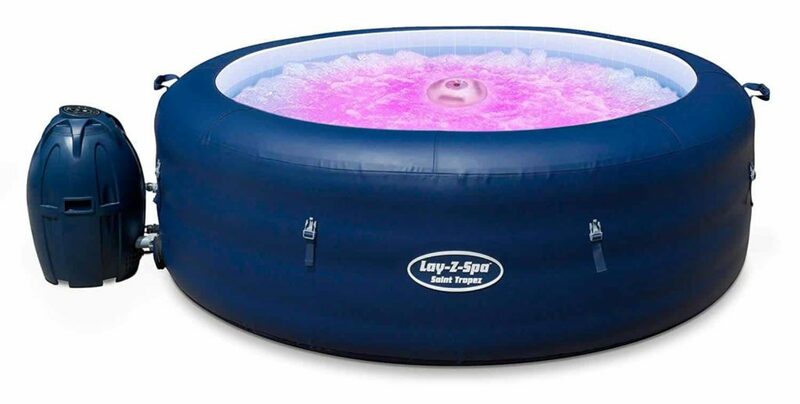 The Lay-Z-Spa Vegas hot tub is perhaps the best cheap inflatable hot tub in the Lay-Z-Spa range. It is one of the most affordable options on our list, able to comfortably accommodate up to 6 people. The Lay-Z-Spa Vegas Hot Tub utilizes a quad horizontal ring construction for optimal durability and stability. This 6-person inflatable hot tub feels as sturdy as a fixed hot tub, but at a fraction of the price. Some people said the lack of an inflatable floor was a little uncomfortable. Having a beautiful mosaic-print design on the interior and base, this portable hot tub is compact and easy to transport. It can be enjoyed indoors as well as outdoors, so you won’t necessarily have to skip a relaxing bubble massage in bad weather. 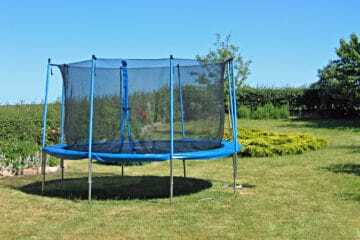 Be careful and check it when you are moving it though, as some customers have found it can puncture easily. An intuitively located control panel commands the 87 high-powered bubble jets, as well as the water temperature, which can be heated up to a luxurious 40 degrees. In line with other inflatable hot tubs, this one also offers a timer so you can set the hot tub to be ready at a certain time. Furthermore, a water filtration system is built-in, though some people complained it could be more efficient. 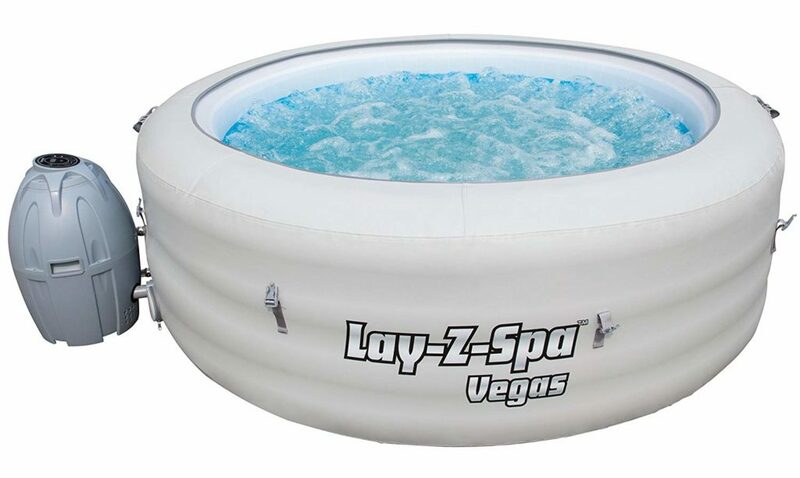 The Lay-Z-Spa Vegas comes with a leatheroid cover as well as an inflatable lid. The MSpa Tekapo Hot Tub Bubble Spa is one of the largest square inflatable hot tubs compared with our other reviews. Having 6 layers of reinforced Rhino-Tech material, this blow up hot tub is super-strong. In fact, it is so structurally sound, that most users can sit on the sides without causing collapse. The floor isn’t padded, so it may be uncomfortable for some. The Tekapo has a new and innovative air chamber to further improve stability. This inflatable hot tub is able to easily fit 6 people with plenty of room to spare. The 132 bubble jets vigorously massage users, helping to soothe tired muscles and encourage peak relaxation. Able to reach 42 degrees, the Tekapo Inflatable Hot Tub boasts one of the highest achievable water temperatures. The heat up time is quite long, usually taking around 12 hours. Both temperature and bubble jet settings can be controlled by the handy wired remote. If you need to preset the timer to prepare the hot tub, you can also easily do this with the remote. The Tekapo inflatable hot tub also features a high-tech filtration system which is believed to be one of the most efficient on the market. This means you can sit back and enjoy the relaxing bubbles, without worrying that you need to check the water clarity. When not in use, the Tekapo is well protected by the included top cover, which can be securely fastened using the attached safety buckles. 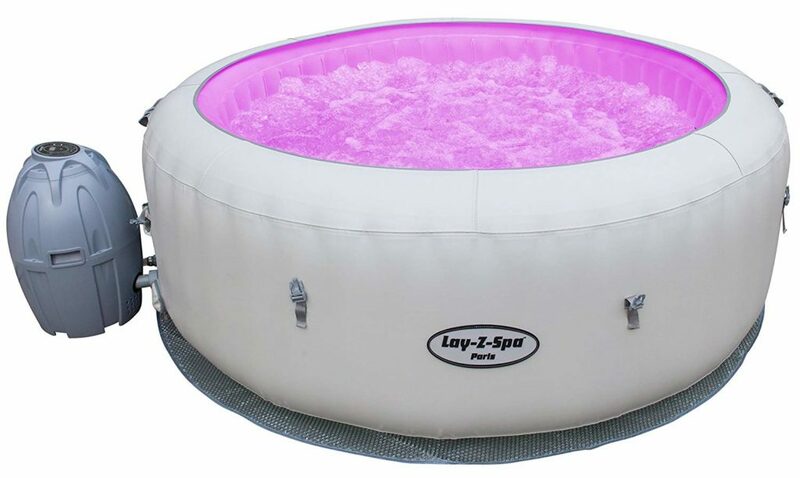 The Lay-Z-Spa Palm Springs is an attractive and sturdy inflatable spa which is suitable for both indoor and outdoor enjoyment. 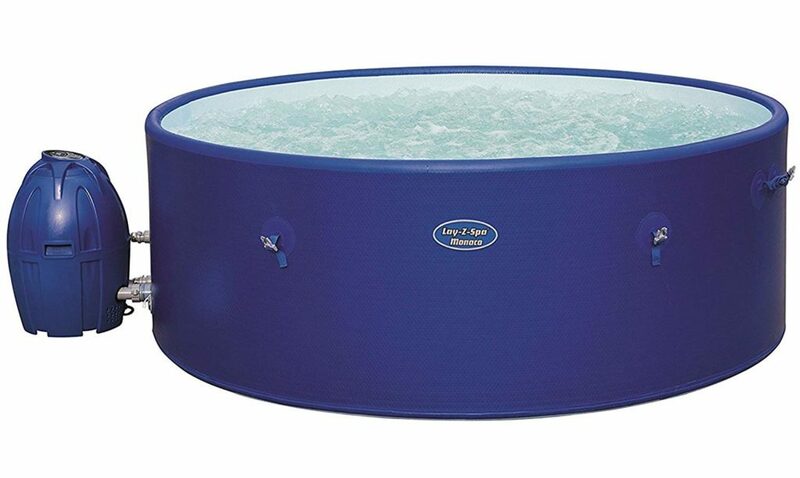 Similar to the Lay-Z-Spa Miami hot tub, this 4 to 6-person model is constructed with super sturdy TriTech and I-Beam technology to ensure a rigid and reliable design. The reinforced 3-ply wall also add insulation so it is easy for the water to retain heat. Bubbling away your worries is a breeze in this inflatable hot tub. Featuring 120 air jets, the 360-degree massage system is considered the best to leave you feeling relaxed and rejuvenated. 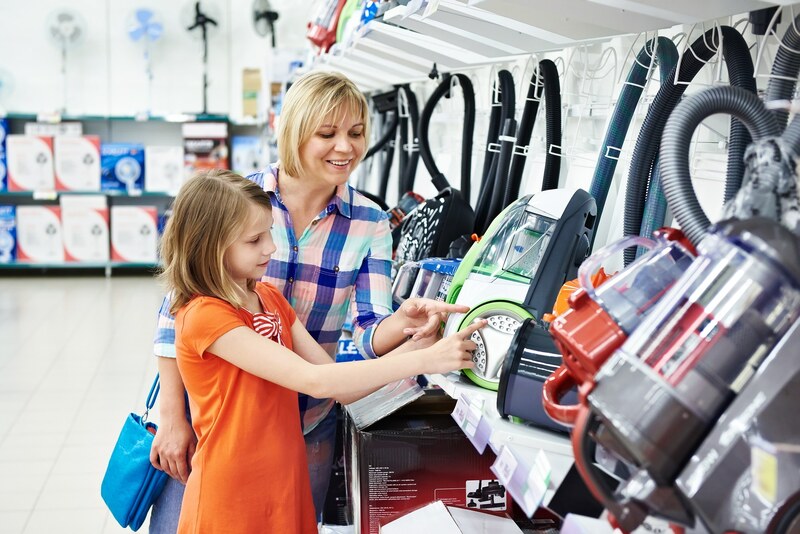 However, the pump can be a little noisy for some and you may need to check and replace it frequently, even with regular maintenance. The Lay-Z-Spa Palm Springs hot tub also boasts a fast heating system which rapidly heats the water up to the maximum of a balmy 40 degrees. Able to hold 963 litres when filled, this spa can be very heavy. It should be used on a strong surface only. Controlling the heat and jet settings is intuitive and convenient thanks to the digital control panel. In line with similar inflatable hot tub reviews, the Palm Springs offers a timer option, so you can set the heater to start up when you’re not home. The Lay-Z-Spa Saint Tropez Hot Tub can make you feel like a millionaire in your own back garden. This portable home jacuzzi is advertised as being able to accommodate between 4 and 6 adults, although some users have commented it’s a bit small for this number of people. Once you have set up and inflated this hot tub, the reinforced walls offer rigidity to rival a fixed hot tub, but with the added benefits of being portable. Be careful and check where you set it up though, as some customers found it can be prone to punctures. Heating the water to your perfect temperature is quick and easy, thanks to the rapid, dual operation heating system. Temperatures of up to 40 degrees can be reached in a few hours, so you can enjoy a soothing jacuzzi experience in no time. If you would rather save energy by leaving the heater off when not in use, you can use the power saving heating timer function to make sure the Saint Tropez is ready whenever you are. With regard to bubbles, this spa offers 87 high powered air jets which are sure to massage away stress quickly – although the pump isn’t the quietest we have seen. Lastly, one of the most attractive features of the Lay-Z-Spa Saint Tropez is unlike other reviews, this has the included floating LED light. Battery operated, this light conforms to IP68 waterproof standards and is able to shine in four different colours to light up your evening. The Lay-Z-Spa Siena Inflatable Spa is a blow-up jacuzzi specifically designed for two people. A dream for couples who like to enjoy romantic evenings in the comfort of their own home, this portable hot tub allows you to best relax together in luxury and intimacy. Unlike other inflatable spa reviews we have listed, the Siena features extra reclining space, so you can really kick back and enjoy the bubbles. It is easy to transport, too. So you can enjoy from a single location or take it with you on your adventures. The elongated shape is so two people can sit facing each other. But, it may make it a little difficult to fit in a small garden. Water temperature can be quickly heated to a blissful 40 degrees due to the rapid heater system. The generous 127 air jets surrounding you on all sides ensure a lavish and unforgettable experience. 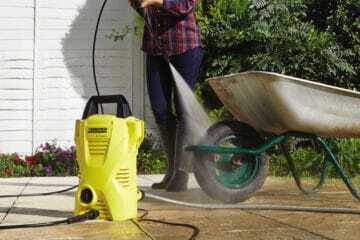 However, a number of customers have complained that the pump is prone to leaks. 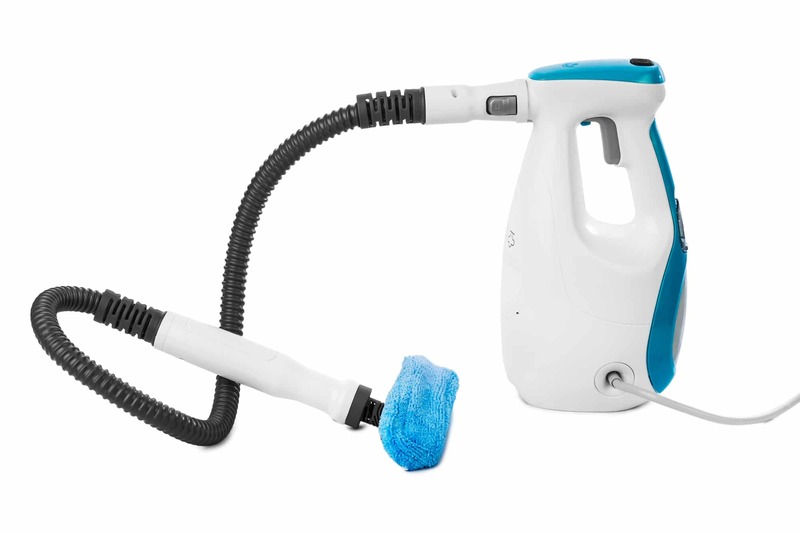 Both the temperature and air jets are effortlessly controlled via the easy to reach the control panel. The Lay-Z-Spa Siena also comes with a removable table which fits in between you and the lucky person you are sharing it with. Simply fill the table with some champagne and nibbles, and you will feel like a superstar. This inflatable spa doesn’t require any special tools to set it up. Installation is easy, but will likely take some practice before it can be achieved in the 10-minute mark as advertised. The Lay-Z-Spa Hawaii is another square inflatable hot tub which aims to impress. Able to sit as many as 6 adults, this portable spa is a great way to bring friends and loved ones together. Designed to be comfortable and puncture resistant, the Lay-Z-Spa Hawaii is also highly durable due to the use of I-Beam and TriTech construction materials. Your fun doesn’t need to be fixed to one location with this spa either. Being highly portable, the Lay-Z-Spa Hawaii can be moved indoors, outdoors or even taken away with you on your next trip. Another great feature of this inflatable jacuzzi is its ability to heat the water while the air jets are activated. This means that the Hawaii will not lose heat when you switch on the 120 massage jets, so you can enjoy the bubbles without feeling the temperature drop. On the downside, the initial heat up time is rather slow. As with most of our reviews, the maximum water temperature is an indulgent 40 degrees, which will keep you toasty even in winter months. The life of the pump is less than fantastic though, so expect to check and replace it frequently if you use the tub often. Water clarity is kept to the optimum level due to high-quality water filtration, so you don’t need to worry about cloudiness. 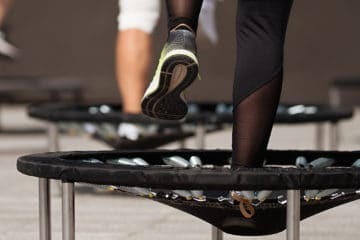 A leatheroid inflatable top cover is included, as well as a pad floor mat for extra cushioning. Some negative comments about the Hawaii are related to inner liner bulging issues, but this appears to have been a rare manufacturing fault. 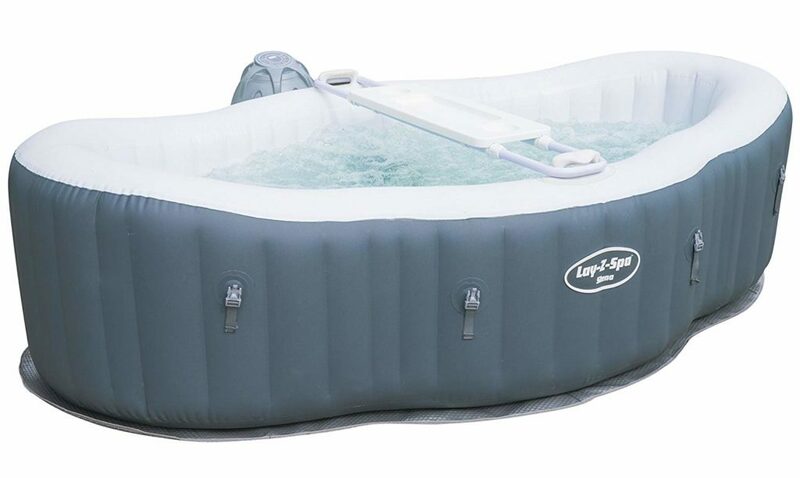 Overall, inflatable hot tubs are a fantastic and economical way to bring the benefits of a spa to your home. Permanent hot tubs are beyond the financial reach of most people, but inflatable jacuzzis can offer the same experience at only a fraction of the cost. While all of our reviews of the top 10 best inflatable hot tubs say they are great options, our winner has to be the Lay-Z-Spa Paris Hot Tub that comes with LED lights. We love how the lights in this 6-person hot tub offer 7 different colours to match the mood, while also boasting 87 high powered air jets for a relaxing massage experience. This one is the best because it is sturdy and durable, thanks to the I-Beam construction, so you can be confident it will last. We also like how the heat and jet settings can be controlled by a handy remote, so you don’t need to move from your relaxed position to change them.